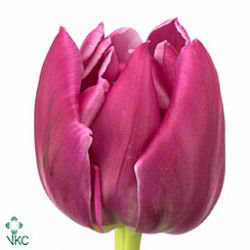 Tulips Double Princess 35cm is a single flowering Pink cut flower - wholesaled in Batches of 50 stems. Tulips will always bend towards the light, so condition in their wrappers to keep straight. Floristry wire can be pushed up the stems before arranging. The tulip is a plant grown from bulb and is a genus ‘Tulipa’ in the Liliaceae family. Although tulips are associated with Holland, the first commercial cultivation began in the Ottoman Empire – the word ‘tulip’ is derived from the Persian word ‘dulband’, meaning ‘turban’. Tulip festivals are held in the Netherlands, Spalding England and North America every May. The largest, permanent display of tulips in the world is in Keukenhof, Holland. Tulips are now very popular in Australia and tulip festivals are held in September & October, (Australian Spring time).